For years now, I've been a huge fan of John Sandford's Virgil Flowers series. I was first aware of Sandford through his long-running Prey series featuring hero Lucas Davenport. With nearly 30 novels in that series, I decided to start the Flowers series instead. Davenport frequently appears in the Flowers books, so I've been curious to see more of him. 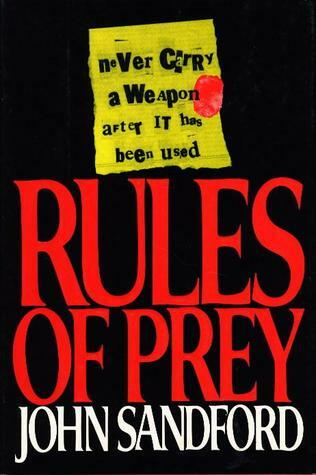 As I always do when starting a new series, I finally buckled down and started the first book, Rules of Prey. Lucas Davenport is an immediately appealing character. He's extremely intelligent and has turned his natural logic and gift at solving puzzles into a side career of crafting the intricate stories of video games. This has given him a very comfortable life that leaves him monetarily and intellectually satisfied. Still, he seems to have found his true calling in solving crimes for the local police. By the time we meet him for the first time, Davenport is a well-established lieutenant ready to take on any challenge that comes his way. He meets a worthy adversary in a killer dubbed the Mad Dog. The Mad Dog is assaulting and killing women throughout the twin cities. Davenport latches onto the set of rules that the killer leaves behind at each crime scene. Each rule that is left reveals more about the way the Mad Dog is operating and leads Davenport one step closer to catching him. It will be a battle of wits until the very end. After reading this first novel to feature Davenport, I came out liking the character, but not as much as I like Flowers. For now, Davenport comes off as a typical male fulfillment character. He's really smart, a total lady's man, and independently wealthy. He's also not afraid to get his hands dirty to solve the crime and stop a killer. That works fine for an initial outing, but he'll have to grow to keep me invested in further books. I've been told by friends that he gets much better over the course of the series. His friendship with a nun in this novel offers a glimmer of promise to the depth the character surely gains over the next 28 books. Beyond Davenport's character, Rules of Prey offers the kind of fast and intricately plotted thriller that I've come to expect from John Sandford. As he does in many of the Virgil Flowers books, Sandford reveals to us the identity of the killer early on. This creates a suspenseful race of cat and mouse as Davenport inches closer and closer to discovering the identity of the killer that we already know. I don't know how long it will take me to catch up on the next 27 books in this series, but Rules of Prey has certainly captured my attention and cemented John Sandford as one of my "go-to" authors. Much will be made about the financial success of director Jon M. Chu's film Crazy Rich Asians out in wide release today. Based upon Kevin Kwan's wildly popular novel, the film marks one of the first large studio releases to feature an Asian cast. In 2018 this shouldn't be such a big deal, but the fact that most articles about the film mention this means that for better or worse, Warner Bros. has a lot riding on Crazy Rich Asians. I enjoyed the novel and got enough laughs out of it, that I decided to see what the film adaptation had to offer. 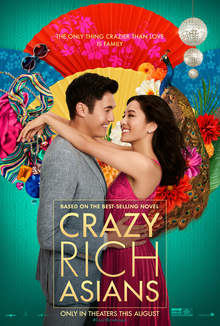 Like the book, the film follows NYU professor Rachel Chu (Constance Wu) as she follows her boyfriend Nick Young (Henry Golding) home to Singapore. One of Nick's best friends is getting married, so this is the perfect opportunity for Rachel to see the place he grew up. Nick has always been pretty quiet about his family, so Rachel isn't sure what to expect. She grows suspicious of him the moment they board their private first class suite on the plane, an extravagance Rachel has never even dreamed of. Soon Nick reveals a huge secret about his family. They are crazy rich! Before the plane even leaves the tarmac, the news of Nick's mysterious new girlfriend reaches his mother played by Michelle Yeoh. Eleanor Young is not impressed with Rachel. Nick may think he's found "the one", but mothers know best. Rachel is American born from a single mother and has no financial or social stature to speak of. Eleanor will not stand by while her son's emotions and bank account are taken advantage of. She has to stop this relationship. I was pleasantly surprised by how much I enjoyed Crazy Rich Asians. Chu's film improves upon the novel by making the characters more emotionally rounded and allowing the themes of culture and family to weave into the comedy. Similar to the way that My Big Fat Greek Wedding bridged Greek culture into universally relatable themes, Crazy Rich Asians finds a perfect balance in highlighting the intricacies of its own unique culture while crafting an emotionally satisfying romantic comedy that should appeal to the masses. Unlike the novel, the film ends with a true conclusion that will leave you wanting more from these remarkable characters. I can't predict what the box office results will be, but I can say without a doubt that I thoroughly enjoyed Crazy Rich Asians. "When I was born, the word for what I was did not exist." 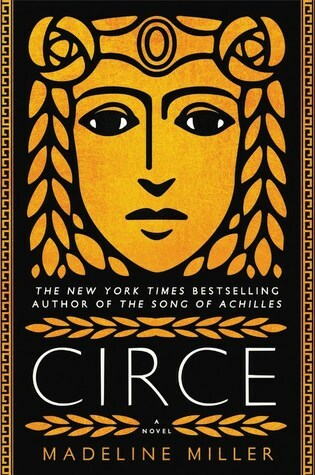 For months now I've seen the gorgeous cover of Madeline Miller's Circe gracing the screen of my phone though countless bookstagram posts, advertisements, and glowing reviews. When I had the chance to read the book as an advanced copy, I passed. It was classified as "women's fiction", so I didn't think it would appeal to me. I'm definitely not the target audience for "women's fiction". Still, I couldn't escape the allure of Miller's novel. Plus, it is 2018. Isn't women's fiction just fiction? Why do we have the need to differentiate? The cover became such a fixture of my awareness that I just had to see what all the fuss was about. Born among gods and titans, Circe is not like the rest of her family. She is not all powerful as her father Zeus is, but she does have some powers of her own. Specifically, Circe is able to use witchcraft, a feat that scares the gods. She is banished to a deserted island and is forced to live a life of solitude. Rather than wallow in her misfortunes, Circe uses the moment to hone her skills and become more powerful. Along the way, Circe is forced to face the best and worst sides of both humanity and mythology. She sees and experiences true love, family, and parenthood. She also sees the brutal evils of lust, anger, and war. Circe's story soon intertwines with some of the more familiar tales of Greek mythology. I was particularly drawn to her interactions with the legendary Odyseuss. Circe by Madeline Miller is a sprawling epic that plays like a greatest hits of Greek mythology. Miller carves a spot for her character amongst some of the better and lesser known myths from the time. Several times I had to pause to research some of the stories to see what Miller was drawing on. Miller elevates her story by placing Circe into moments that force her to face normal human emotions and challenges. By giving her character and empathetic soul, Miller brings the gods and legends down to a level that all readers can relate to. Despite the ambitious story that spans global history, I couldn't help but feel disconnected from large portions of the novel. Given all of the positive reviews this book received, I was surprised to find myself longing for more from it. Too often, Miller's characters simply tell the epic stories. This makes them removed from the action. Although I can't give Circe the unbridled support that others have, I certainly appreciate the scope and depth that it sets out to present. I've had a busy summer keeping up with a reading schedule of mostly new releases. I have a few weeks before my next ARC hits the shelves, so I've decided to take the next couple of weeks to catch up on some of the books that have been languishing on my shelf. To kick things off, I turned to a book that has been on my shelf for nearly a decade. 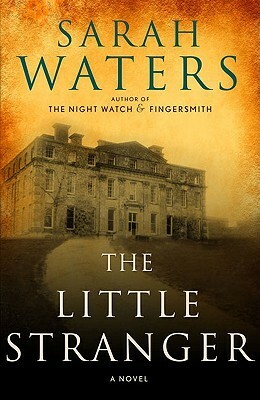 The Little Stranger by Sarah Waters first caught my eye when it appeared in the top spot on Stephen King's best books of the year list in 2009. I was just starting my undergraduate degree and was turning to fiction as an escape from my other course reading. I quickly bought a copy of the novel, and it has sat on my bookshelves ever since. Nine years and hundreds of books later, I finally decided to give it a read. "We see what punishing business it is, simply being alive." Following the end of WWII, the once sprawling estate of Hundreds Hall has turned into a disheveled remnant of a time that is soon to be forgotten. Most of the rooms sit vacant, in fact, the entire estate is empty save for an elderly mother and her two adult children. Each child does their part to keep the home running. The daughter tends to the home as best as she can while keeping her mother occupied. The son, injured from the war, does his part to keep the farm afloat. The mother spends her days thinking back on the way things used to be. Things seem to be looking up for the family when they are finally able to gain the aide of the young housemaid. Sure, it is not the large staff that used to keep Hundreds Hall buzzing with activity and prestige, but any help is welcome. When the young girl falls ill, the family decides to ring Dr. Faraday, the son of a maid who worked his way to become a successful country doctor. Faraday quickly surmises that the girl's illness is not a physical ailment but rather simple homesickness. Faraday prescribes a day off and is on his way. But something keeps drawing him back to Hundreds Hall. The more time he spends there, the more sinister it seems. I went into this one expecting a novel filled with shock and horror. What I got was a more straight-forward work of historical fiction with slight tinges of understated suspense. That's not to say that The Little Stranger isn't scary. Rather than the pure horror of the traditional sense, Waters writes a nuanced character study that brims with a dark undertone that is far more unsettling. After making it through the rather laborious opening portion of the book, I found myself completely enthralled with the characters who inhabit it. The decaying home of Hundreds Hall becomes a physical representation of the characters as they erode into the hysteria of paranoia and unrest. I don't know that The Little Stranger will end up making my own year-end list of best books, but I do know that it provided a chilling read and different pace from my usual summer reading.